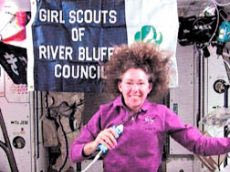 Earlier this year, the Girl Scouts of River Bluffs, IL, had the opportunity to chat live with Dr. Sandra Magnus. Magnus, a former Girl Scout, spoke to the girls about the confidence they will gain from being involved with scouting. Read the full story in The Telegraph. Speaking of space, the Girl Scouts have partnered with NASA to enable thousands of girls to look beyond the boundaries of earth and explore the expanse of the universe. NASA scientists are committed to introducing girls to earth and solar science through fun, informal education activities. A 2009 grant from NASA will launch the Girls In Space project which is designed to teach girls about astronomy and careers in the field.